I Finally Learned How to Pop Popcorn! I may have ruined a pan in the process, but I finally learned how to pop popcorn! Now, I don’t mean I just learned how to put a bag in the microwave or work some kind of popcorn popper. I mean I learned how to take a bag of kernels and pop them in a pan on top of my stove without using a ton of oil. Why is this a big deal? It’s not, but it does give me a filling, crunchy, high-fiber, low-calorie, gluten-free snack that I can keep handy in the pantry. Okay, I must confess that it sometimes feels like a big deal when I’m craving chips, but know I’ll be satisfied by a bowl of popcorn topped with salt. Popcorn is a healthy snack so long as it doesn’t have lots of oil and chemicals added. That means you’ll need to avoid microwave popcorn, movie theater popcorn, and even pouring a bunch of oil into the bottom of your pan when popping at home. Don’t worry, that doesn’t mean you’re stuck with tasteless, less toasty air-popped corn either. What’s wrong with microwave popcorn? That wonderful smell microwave popcorn generates comes from a chemical called diacetyl, a synthetic buttery flavoring. Diacetyl causes “popcorn lung” in popcorn factory workers, and can generate lung problems for those who make it frequently. Another chemical that lines microwave popcorn bags can cause thyroid issues, high cholesterol and bladder cancer. In addition to the chemicals, standard microwave popcorn has added fat that boosts the calories to 413 per 2.5 oz bag. You have to eat less of it to reduce the calories or switch to low-fat popcorn that still has 300 calories per bag. And if you have to eat less of that, your crunch craving may not be satisfied. Movie theater popcorn is better anyway. As far as taste goes, movie popcorn is delicious. I’ve never liked to add butter because it makes the popcorn soggy and I just don’t like it, but even without added butter, a small movie popcorn has about 400 calories. A large can have as many as 1200 and most of those calories come from saturated fat. Air-popped popcorn is great if you have a hot air popper. It drops the calorie count to 31 calories per cup of popped popcorn. A cup of popcorn contains 1 gram of fiber and less than 1 gram of fat. It’s also contains protein and is high in antioxidants. It sounds like air-popped ideal. The problem is, I used to own one of those air poppers. Not only did I find the popcorn less tasty, I don’t like having a bunch of electronic gadgets in my kitchen. For me, air-popped is not ideal. I went looking for other options, remembering my previous failures using oil and a pan. 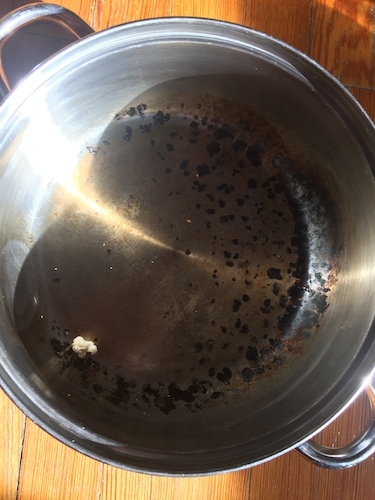 In my research, I read that you can pop popcorn in a pan on top of the stove without any oil. I tried it. I ruined my pan. I also read you can microwave popcorn in a brown paper bag. I don’t happen to have any brown paper bags lying around my house. I wonder if a white bag would work, but I don’t have one of those either. I approached the problem like I would any recipe variation. I took a moment to think through the problem. I knew I needed a little something to keep the popcorn from sticking and burning into my pan, so I pulled out my olive oil cooking spray. A .25 second spray has no calories or fat. That sounded promising. I formed a new corn popping plan. Luckily, it worked. Spray the bottom of a 6 quart cooking pot with olive oil spray. Turn a large burner on medium. Place the empty, sprayed pot on the burner and allow it to get warm. Get out a timer that will count in seconds. Once the pan is hot, place one-third cup of unpopped popcorn in it and put on a lid. Gently shake the pan a few times every 10 seconds. Yep, again already – every 10 seconds. Do this before the corn pops. Do this while the corn pops. Do it until the popping slows. When the popping slows, turn off the heat. Leave the lid on for a few seconds. A few kernels may pop after the heat is turned off so if you remove the lid immediately, it may pop right out of the pan which is kinda cool, but startling. Pour the hot popcorn in a bowl and sprinkle with salt. I know it seems like no salt will stick, but enough will hang on. You’ll end up with about 8 cups of popcorn. That’s a snack with about 172 calories, 2.02 grams of fat, 5.76 grams of protein, 6.5 grams of fiber, and tons of crunch. The same volume of potato chips would have 1096 calories. Obviously, popcorn is a better snack choice than potato chips. With this easy popping plan, you can enjoy popcorn at home with no special equipment. 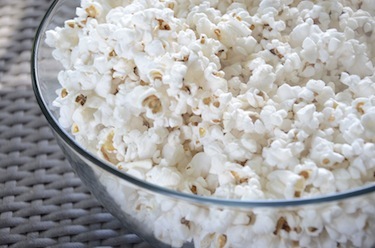 You’ll save money, calories, and pans while avoiding the toxic chemicals in microwave popcorn. Now you can have ice cream more often. I call that a win!